While Joakim Noah has garnered some well-deserved national attention with his play, he’s hardly done it alone. Noah is the first to admit as much, so it came as no surprise when he pointed out the job done by D.J. Augustin, who most recently scored a team-high 22 points off the bench in Chicago’s overtime victory against Miami on Sunday. Through five games in March, Augustin has averaged 20.2 points while shooting 51.7 percent from the field and 46.2 percent from behind the arc. Augustin quickly adapted to Chicago’s system after he was signed on Dec. 13. But he’s perhaps played his best basketball as of late—through five games in March, he’s averaged 20.2 points while shooting 51.7 percent from the field and 46.2 percent from behind the arc. “I’m just in the moment, trying to work hard every day, just go out there and try to play hard, play well and do whatever it takes to help the team win,” said Augustin on Friday. 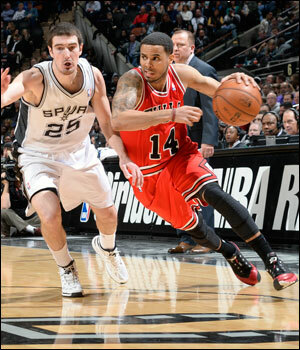 Augustin has also demonstrated the ability to get the job done whether starting or coming off the bench. While his recent hot streak has been as a reserve, he started nine games this season and averaged 17.8 points and 6.4 assists while shooting 45.8 percent from the field and 48.3 percent from three-point range. But it’s clear that when he talks about his current role, it’s one he embraces. Augustin admits he’s playing with confidence, something that has shown at the free throw line, where he’s connected on 25 in a row and 60 of his last 61 attempts. He leads the NBA in free-throw percentage at 91.7 percent, making 133 of 145 on the season. Whereas Augustin always knew he was capable, it’s getting a chance to prove it which has helped him help his team. He also credits Bulls coach Tom Thibodeau for allowing him to work through situations on the court without the fear of being pulled.